Break away from the typical fat burning methods of cardio, interval training and bodybuilding workouts by combining kettlebells with a TRX suspension trainer. 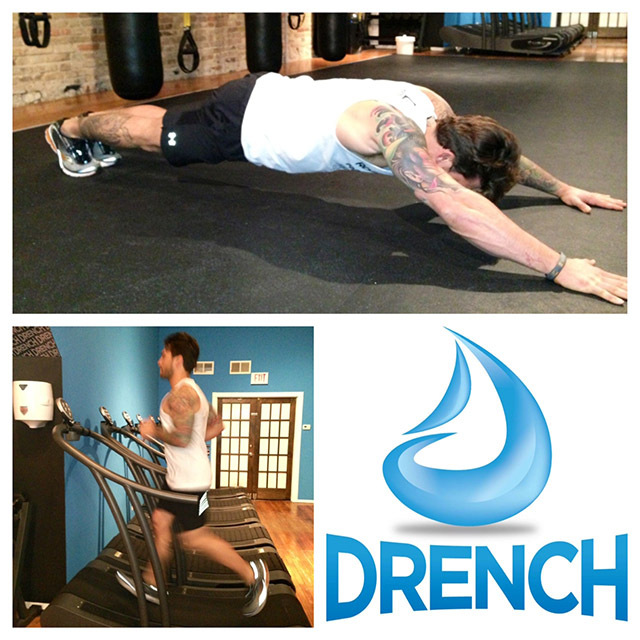 We’ve asked owner of Drench Fitness boutique and training correspondent to HUMANFITPROJECT, Adam Von Rothfelder, C.S.C.S. for a combo workout that will push you to the limits and lean you out in no time. Each exercise is to be completed in a circuit format with zero rest in between exercises. You will complete each circuit for a total of four rounds. You may take 1 minute breaks in between rounds. Placing weight roughly 6” in front of your feet, swing the kettlebell back with your hips. 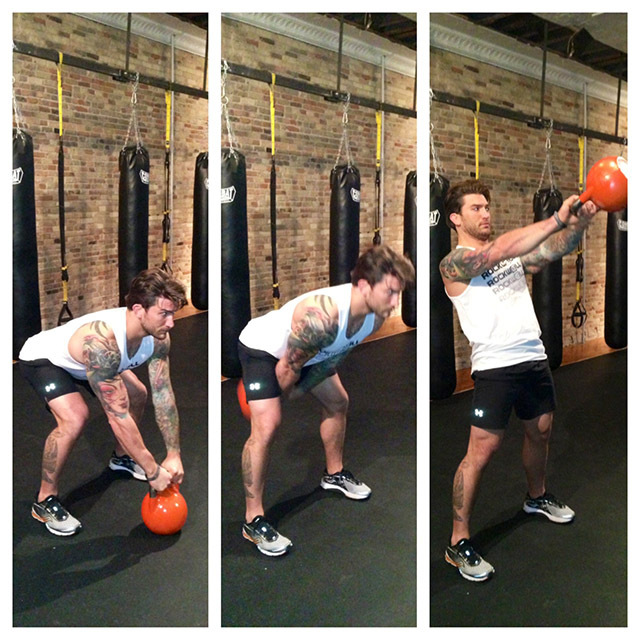 Drive your hips forward and swing the kettlebell to about shoulders-height. At this point, begin to bend your elbows at peak of the swing and re-direct that swinging momentum into an overhead press without any pause. 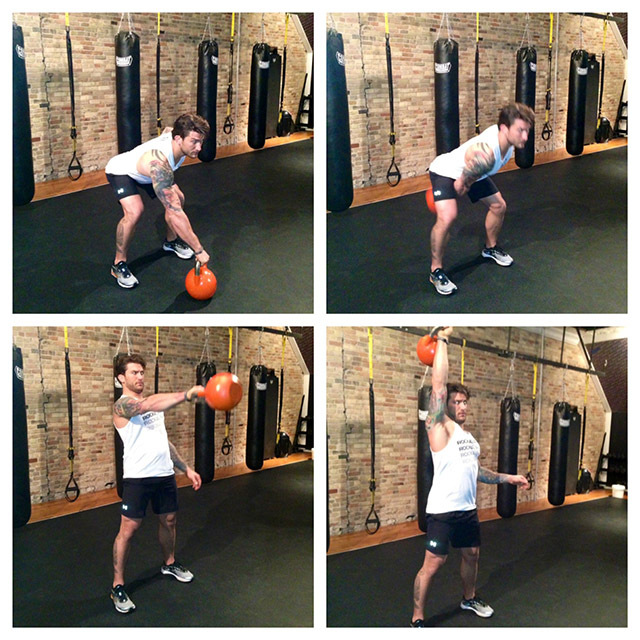 Hike or ‘clean’ the kettlebells up from the floor up to your shoulders. 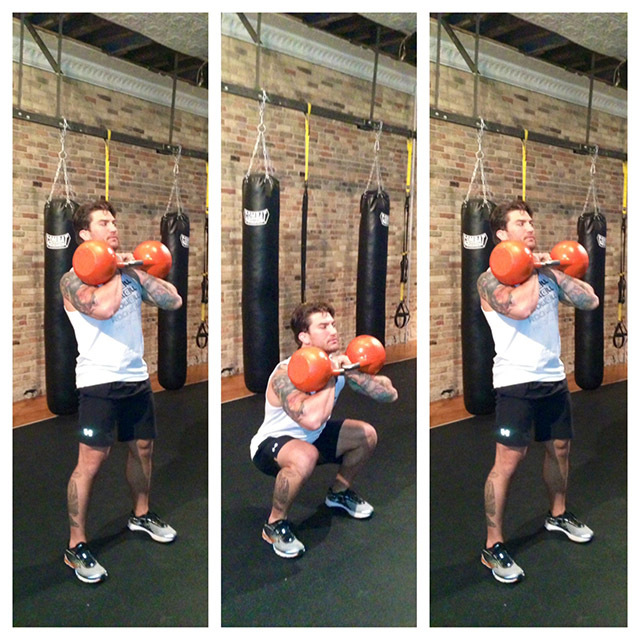 With your elbows pointing forward, position the kettlebells on your shoulders and biceps. (as illustrated) From this starting position, accept the weight of the kettlebells on your heels, slowly lower hips and squat as deep as possible. Descend three seconds down and explode upwards as quickly and powerfully as possible. With both your hands on a single kettlebell approx. 6″ in front of you, set your hips back and swing the bell back with your arms. When the kettlebell reaches it’s further point behind you, explosively drive your hips forward and upwards while swinging the kettlebell slightly above shoulders-height. Control the descent of the bell and repeat the movement fluidly. 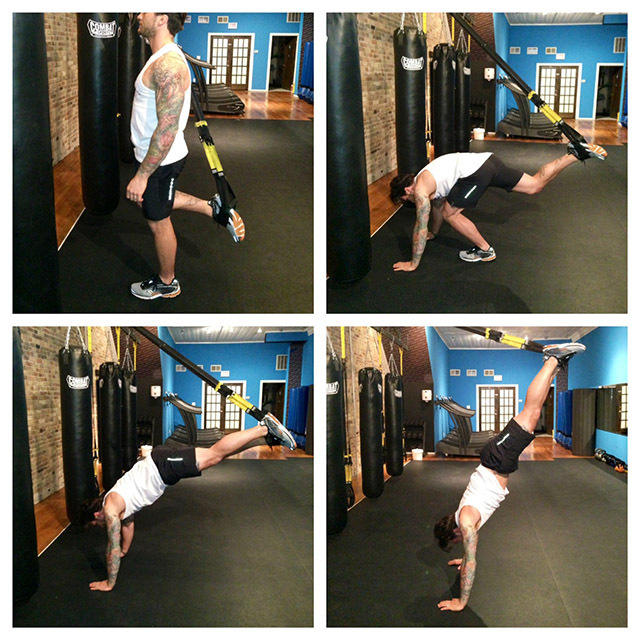 Place your right foot in both TRX straps and balance yourself by positioning both hands on the ground and slowly walking backwards while extending legs in air. Your toes should be pointed up and hips pulled in while keeping your lower abdominals tight. When you’re set and stable, slowly lower yourself into press until head is 2″ off ground. Press upwards through your palms and complete the push up. Repeat. 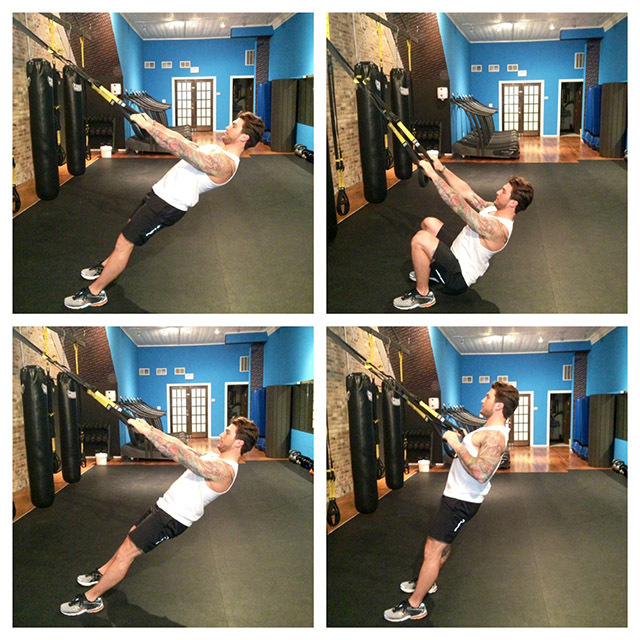 While holding each TRX handle, lean back at a 45 degree angle with your arms fully extended. Lower your glutes into your heels similarly to a squat and get a low a possible. From this bottom position, with both your arms and your legs, pull/row yourself upwards. Repeat. Start in plank position, pull your hips and lower abdominals tight like you’re tucking tail in between legs. Slowly walk your arms out as far as you can go until your nose is 1-2″ from the ground. Focus on keeping your shoulder blades tight, your arms extended and flexed, and your core tight. * In between holds, perform quick, 10-second sprints.